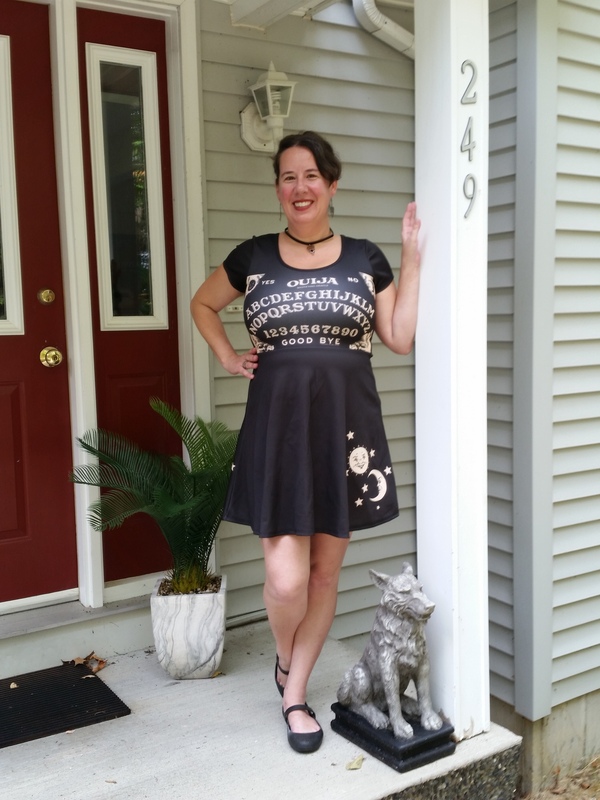 My Ouija Board costume. It’s missing the leggings in this photo–I only got the leggings so that it would be more appropriate in certain situations; it’s a little short, and HALLOWEEN IS COLD SOMETIMES!! I’m too old to Trick or Treat and we live in an isolated spot where no costumed reveler would venture, but I still like to wear a costume every year…I go to the day job and pass out candy to everyone in the building. I have so many costumes that most years I don’t have to put together or buy anything—I just go in and yank from my stash. This year was different. My sister came down for a visit, and we decided to hit up the mall for some retail therapy. We wandered into Halloween Spirit, where I was drooling over Day of the Dead accessories (I’m always looking for more to go with my wedding gown, which I’ve used as a costume on occasion). We went to the check-out, and I saw a Ouija Board costume display. 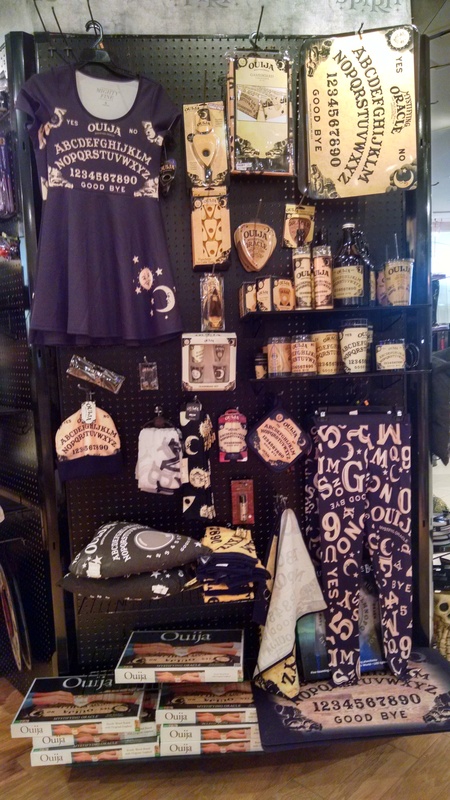 The Ouija costume display at Spirit of Halloween in the Danbury Fair Mall. The dress I bought is on the top left; the leggings (which I went back and got later) were on the lower right. Too bad they didn’t have a hat or a bag! After a lifetime of being told that Ouija was evil, I defied all that in college and tried one – and ended up having a very bad experience. I will never touch one again. So no one was more surprised than me that this costume struck me as fresh, different, creative—and my choice for this year’s costume. The dress, shoes, and jewelry. A shot of the jewelry — a choker and earrings — close up. These are the leggings. Not part of my original costume, but the skirt is a little short for certain situations and the average high today is only 55. Plus our office building is freezing all the time. I often get asked about what influences my work as a writer. Inspired by the amazing website Kindertrauma–which is right up my alley–I’m compiling all of my childhood (and some adult) terrors. 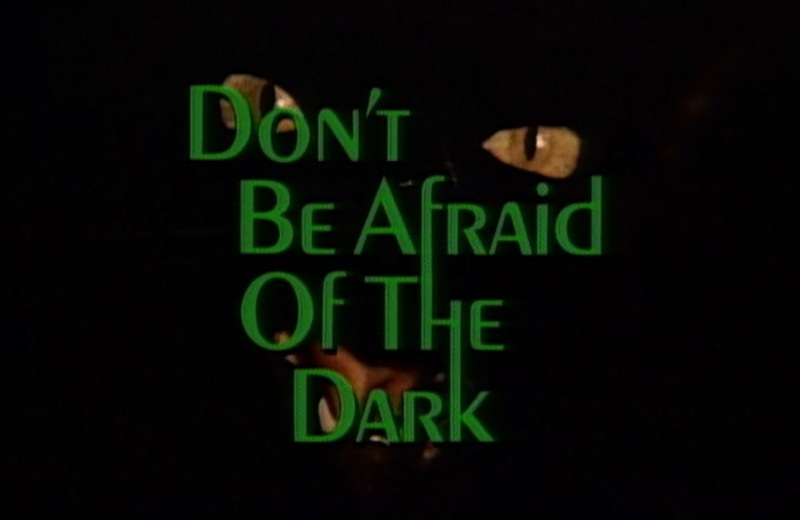 I first watched 1973’s Don’t Be Afraid of the Dark on a Sunday afternoon in the late 1970s—at my grandmother’s house, on one of the channels that always ran repeat made-for-TV films.